I love this picture of Mr. Wright -- he looks very cool. By the way, the above quote really expresses how I feel. Richard Wright is one of my favorite writers of all time. His often polemic style of writing both dazzled and frightened his American audience in the 1940's and 1950's. I've read most of his writing, and he never failed to address the issues that affected the black community, and ultimately, American society as a whole. Unfortunately, most blacks at that time didn't know Richard Wright. Richard who? (They still say that) They were too busy living the lives that he was writing about. Most blacks didn't know why Big Boy left home in Uncle Tom's Children (1938) or why Cross Damon was on the run in The Outsider (1953). 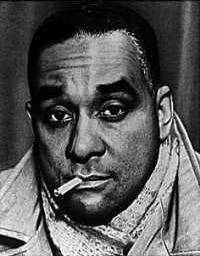 They never got to know Bigger or Fishbelly, but each and every black person in America filled the pages of Richard Wright's novels, and he represented them with all the beauty and ugliness of who they were. They would have been proud if they knew. They would've been as proud as I was when I first opened the pages of The Long Dream (1958). I even made up a cast for a tv movie that would star Samuel Jackson. They would've been sad and maybe cried as I did when Bigger Thomas had to atone for his sins in Native Son (1940). Yes, he eventually left America, and still often toiled with the American press before his death. I can't help but wonder what he would've written about the civil rights movement? Richard Wright was a great American writer. He died in Paris, France in 1960 at the age of 52. My son, he's a junior in high school, is reading Black Boy right now. I'd not heard of it. I'm eager to read it too after hearing him talk about it. Thanks for this. I think you'd made Richard Wright proud. Thank you Kathi! That would make me happy if he approved. :)Yes, Black Boy is his autobiography and it is fantastic! I really enjoyed that book. My favorite book from him is "The Outsider." His character Cross Damon is great. I think that you will enjoy them. The issues are timeless and you really don't feel like your reading an "old" book. It's all very fresh. My ten year old son read it [Black Boy] for an oral report in class and the teacher sent him home with a note saying that she was not sure if it qualified for non-fiction as she had not heard of it. Sadly it does and even more sad was the fact that she didn't know it. Thank you for sharing this with your readers. Very interesting indeed. As soon as I get a break from the textbooks, I am DEFINATELY going to check him out!!! Thanks for teaching us about another wonderful person in history, that some of us other wise probably would not have heard of! You rock Stephen!! wow @ the teacher not knowing about Black Boy!!! but you are correct. it is interesting that so many of our writers ar the time had to escape America (i.e. James Baldwin), because it wasn't ready for their honesty & genius. i'm curious to know what many would have had to say about the movement & about how it has/hasn't been realized today. That is very sad for a "teacher." It sounds like the teacher needs a lesson. Thanks for stopping in. I know that's right. They weren't ready at all! a lot of black people weren't ready for their honesty. BTW, it's very sad that the struggles of the past are not realized today. Thank you for visiting. I would've never known about Lorraine and James. I'm linked! GREAT post! This seems to have been a large exodus not just for writers, but for black artists altogether. I know Paris ended up having one of the great jazz scenes in the world, with Sidney Bechet, Bud Powell, Kenny Clarke, and Dexter Gordon all living there. In any case, I would give my right eye to be the writer that Richard Wright was. I don't know if he ever wrote poems, per se, but the man was a poet nonetheless. Swinging by to wish you a great weekend! Hello! How is life? Thanks and have a great weekend! Yes, admire his writing very much. Btw, I would give some sort of limb too to have his appeal as a writer. Yes, Paris was a chill spot back in the day for black artist, but not anymore. Haa haa! :) Too many black immigrants showed up and France showed it's true nature. Anyway, I also love Bud Powell and his style of Jazz Piano. I purchased his cd this time last year. Thanks West. Inevitably makes us think about the unjust racial issues of hate based solely on skin color. If you must know about Richard Wright, you must read first his autobiography Black Boy (a fascinating story where the child is the father of the man and throughout his journey for self-acceptance and self-discovery he reveals the pain-psychological and physical-of African Americans as an outcome of the segregated south. I am also a fan of Richard Wright...I identify a lot with his emotional reactions to white racism in the book, "Black Boy" (which I refer to in my blog)...however, I must say I was disappointed when I learned that his most significant relationships were with white women - I kind of feel that this was a huge contradiction in relation to the kinds of emotions that he expresses in his work. Yes, and the hostile, integrated, but polarized north. Chicago was famous for this. Thanks for that very clear statement. It makes one wonder how much he was affected and infected by that hostile Jim Crow system. Thanks for that. Which one of your books would you recommend to someone that is reading your work for the first time?